Should a therapist disclose personal information to a client, accept a client’s gift, or provide a former client with a job? Is it appropriate to exchange e-mail or text messages with clients or correspond with them on social networking websites? Some acts, such as initiating a sexual relationship with a client, are clearly prohibited, yet what about more subtle interactions, such as hugging or accepting invitations to a social event? Is maintaining a friendship with a former client or client’s relative a conflict of interest that ultimately subverts the client-practitioner relationship? 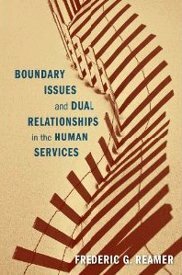 Frederic G. Reamer, PhD, a certified authority on professional ethics, offers a frank analysis of a range of boundary issues and their complex formulations. He confronts the ethics of intimate and sexual relationships with clients and former clients, the healthy parameters of practitioners’ self-disclosure, electronic relationships with clients, the giving and receiving of gifts and favors, the bartering of services, and the unavoidable and unanticipated circumstances of social encounters and geographical proximity. With case studies addressing challenges in the mental health field, school contexts, child welfare, addiction programs, home-healthcare, elder services, and prison, rural, and military settings, Reamer offers practical risk-management models that prevent problems and help balance dual relationships.